In the month of October, 2014, DC Comics will garnish their covers with a monstrous piece of artwork. Scott Lobdell will acknowledge this event by eating a live goldfish. Where as RB Silva will be joining him with a tin of beans. You have been duly warned. To QUOTE Jessica Lange: 'I regret those times when I’ve chosen the dark side. I’ve wasted enough time not being happy'. The book opens up with a grieving Jason Todd keeping watch over a badly burned Roy Harper, so badly burned that it's very unlikely for him to survive the night. Jason then starts talking to the audience bringing the story back where issue 34 left off, with Roy and Jason looking in awe at the mess that used to be a former slave trader. After taking care of this matter, they fly back home to find a very different Kori. A Kori so different that it prompts a decision to blow up in everybody's face -- literary -- thus shaking Jason to his very core. On his return interview Scott Lobdell promised to keep challenging expectations and doing things completely unexpected -- and by god -- he’s keeping his word. Not content with making Kori deal with a drug addiction, he also gives a great reason for Jason to take Venom, as well as kick Roy way off the table in a equally shocking fashion. All of this makes for a very controversial issue while also starting an arc that will shape this book for a long time. 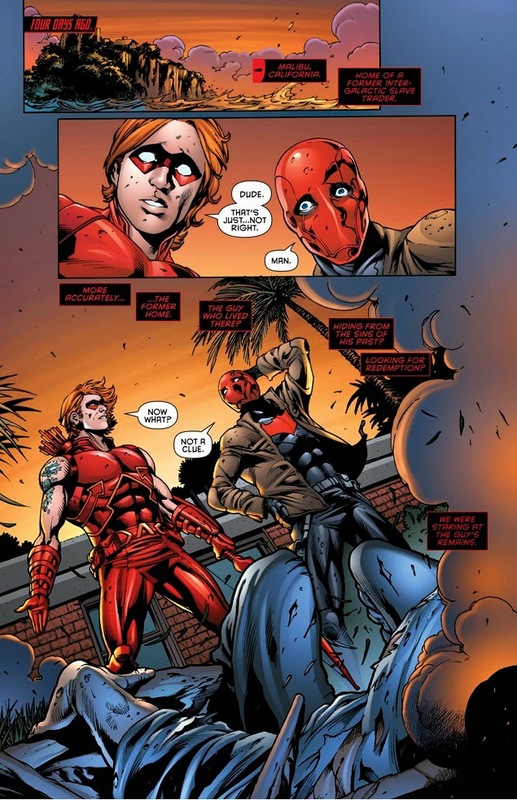 Now starting this story by showing a vulnerable Jason worried sick for Roy’s well-being is the perfect follow up from the previous issues’ friendship themes -- and overall, grows Jason as a character. Long gone are the snarky remarks and denials over the three of them being friends, and this is replaced by concern and the acknowledgement of Roy's status plus one of the most important people in Jason’s life. All of this makes the issue’s closing scene very poignant, since -- in a way -- Jason’s at fault for Roy’s state. Despite Kori’s actions being the catalyst for everything that transpired in this comic, she’s a background character, barely having lines and reacting to the plot instead of being an active player. And yet, Lobdell manages to deliver a realistic take on her drug abuse -- the way Kori confesses her love for Roy under the influence is truly heart-breaking. But it's on Roy where the writing really shines. You can just feel how impotent he feels at everything they built together coming crashing down for reasons he doesn’t fully understand. A running theme on the book is Roy’s role as the heart of the team -- the glue that keeps the three of them together -- and seeing him worry about Kori even when he’s at death’s door really drove home this fact. Ollie’s surprise appearance, while very brief (just a page long), does more to build his status as Roy’s mentor than his role during the book's first annual or Roy’s few mentions on the Green Arrow title. Jason’s reason for using Venom is also fantastic: concise, simple and very true to his character. What is the thing he fears the most now? Dying again. Losing everything to fate (in a cruel irony, this very act could break the team completely). This reason also ties neatly with his characterization on the Future’s End issue -- once he lost his friends, he also lost his will to live and started living recklessly hoping to end his pain. A lot of people will be really upset at this turn of events, but Jason defining trait is that he doesn’t gives up, ever. And so, he will just become stronger from the whole ordeal. Despite how pleased I was for the characterizations, I can’t turn a blind eye to the fact that the events are somewhat over-dramatic in tone. This is especially true on Roy’s fate, putting him on a hospital bed is somewhat of a cheap shot to remove him from the narrative whilst also playing with the readers’ feelings. And what's more, having him deal with Kory’s and Jason’s drug abuse would make for a much stronger narrative. Oliver’s appearance can also spell issues on an editorial level, with Arrow’s 'show runners' now heading the Green Arrow book. I wouldn’t rule out this situation as being some kind of 'soft reboot' for Roy to bring him closer to the show’s depiction. 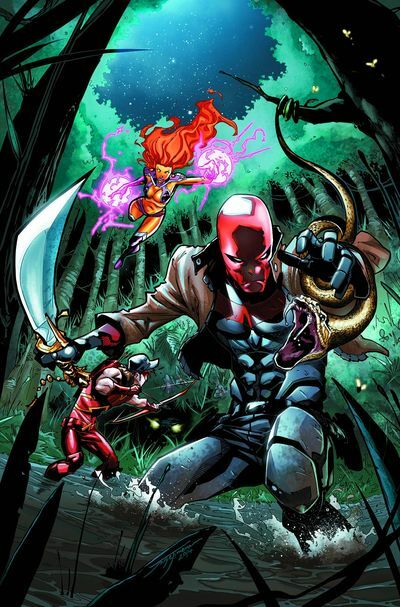 Kori’s falling into drugs, while consistent with the fact of Roy and Jason being her strength (therefore she feeling utterly lost by what she perceived as a betrayal being perfectly reasonable), comes off a bit forced thanks to the apparent disconnect between issues and being mostly a underlying theme through the book’s entire run. There’s also the fact that thanks to The Dark Knight, the Arkham game series, and Arkham War, Venom has lost its uniqueness (it seems everyone can get a dose now) making Jason’s actions less shocking. The art-work was also a bit spotty during the latter half of it's telling. Nothing too detrimental but really noticeable. A rushed job no doubt, since the sequence of Jason fighting the venom-enhanced thugs was very cinematic and exciting. Bastille’s 'Things we lost in the fire' perfectly conveys Jason’s state of mind while he keeps watch over Roy at the New Orleans General Hospital. Whatever happens at the end of the arc, things will never be the same again. 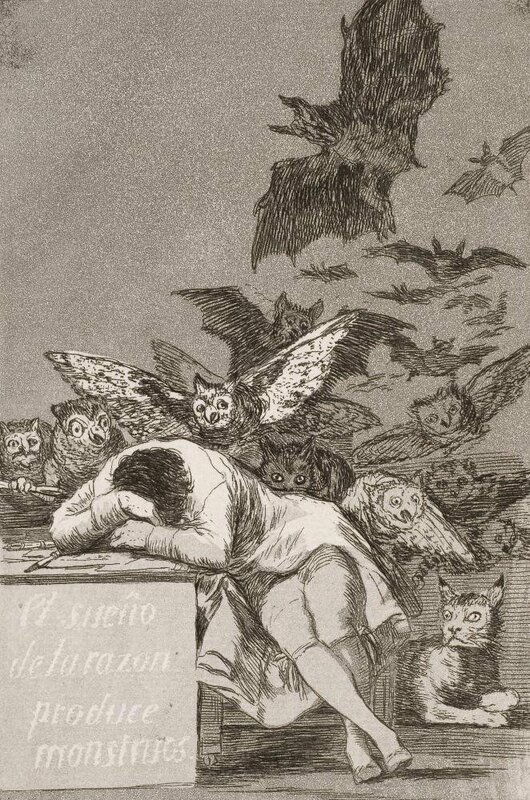 Since everything that happens in this adventure spirals down from Kory’s momentary lapse of judgement, Goya’s 'The sleep of the reason produces monsters' is its perfect comparison. They’ve found happiness at last and a single mistake has brought only ruin upon them. This chapters writing is very strong and continues developing the bonds between the Outlaws whilst adding some very unexpected and interesting facets to them. But it gets held down by being unnecessarily dramatic and too subtle on certain points. Although as a starting point of a new arc, it is perfect to leave the story on one hell of a cliff-hanger and the reader craving for more.